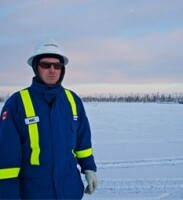 ConocoPhillips Canada has business development and exploration interests in unconventional exploration areas, in the Arctic and in Atlantic Canada. As of Dec. 31, 2016, we held approximately 0.7 million net acres in unconventional exploration plays in the Canol, Montney, Muskwa and Duvernay region. During 2016, we continued to drill exploration and appraisal wells in the Montney play, which extends from British Columbia into Alberta. Since the late 1960s we have had a prominent position in the Beaufort Sea and Mackenzie Delta. In total, we hold interests in 49 significant discovery licenses and one exploration license. At Dec. 31, 2016, the total leasehold for the Beaufort Sea and Mackenzie Delta region was approximately 0.7 million net acres. In the Arctic Islands, we hold interests in 13 significant discovery licenses. At Dec. 31, 2016, the total leasehold for the Arctic Islands region was approximately 0.2 million net acres. We hold interest in six exploration licenses covering approximately five million gross acres in the deepwater Shelburne Basin, offshore Nova Scotia. We also hold interests in five significant discovery licenses in the Labrador region.